That's the normal price?? Not really a deal? They had the £40 wooden kitchen (bit smaller than this but same concept!) set up in our local ASDA! Glad we saw it before we bought it, looked very flimsy and really poor quality, didn't look like it would last 5 minutes after being played with by a heavy handed toddler! 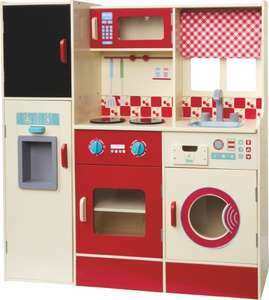 I bought the small version of the kitchen with hobs, oven, sink and microwave. It's actually very good. Very sturdy and looks really lovely. The accessories bought separately compliment it very well. The bonus is it is wooden and not nasty, tacky plastic. my friend has the £40 one and it is great value for money.